Hoffenheim's Julian Nagelsmann was voted DFB Coach of the Year 2016 ahead of beating Bayern for the first time in the club's history. Nobody could have predicted the impact that Julian Nagelsmann would have when he was appointed Hoffenheim coach on 11 February 2016. Fancy bolstering your Official Fantasy Bundesliga team with some Hoffenheim stars? Just click here to do so! The then 28-year-old had already been earmarked to take over in the summer but was thrust into the top role earlier than planned after Huub Stevens had to step down for health reasons. On the pitch, the situation was bleak. The club were second bottom of the Bundesliga and seven points adrift of safety. The transformation since then has been staggering. Not only did Hoffenheim stay up last term – winning seven of their final 14 matches – but the Sinsheimers have only lost three league games this season, and are now guaranteed to play European football for the first time in their history. 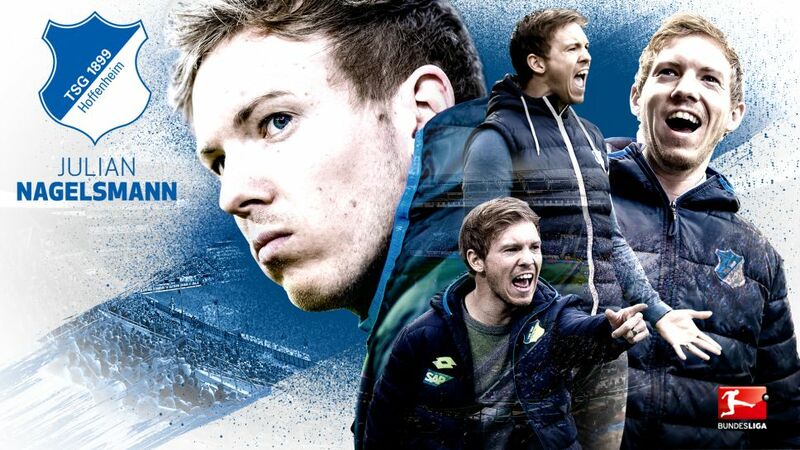 Another highlight of Nagelsmann's tenure was the Matchday 27 victory over Bayern Munich, as the 29-year-old became the first TSG coach in their history to get one over on the record champions at the 18th attempt. A former youth player for 1860 Munich and Augsburg, Nagelsmann took over a side with two wins in 20 matches and has moulded them into one that is both pleasing on the eye and very hard to beat. Indeed, in the 13 months since Nagelsmann became the Bundesliga's youngest ever permanent head coach, only Bayern Munich and Borussia Dortmund have accumulated more points in the league. Just five other teams in Bundesliga history have gone through the first half of the season unbeaten and Hoffenheim were the last team from Europe's top five leagues to lose a league match this season – away to RB Leipzig on Matchday 18. Nagelsmann has proven to be tactically flexible – employing three-, four- and five-man defences – and several players have flourished on his watch. The rejuvenated Sandro Wagner already has 11 Bundesliga goals this campaign, while the form of centre-back Niklas Süle and midfielder Sebastian Rudy has earned them moves to Bayern next summer. Hoffenheim were famously top at the halfway point in 2008/2009, their first campaign in the top flight, but Ralf Rangnick's side eventually fell away to seventh and missed out entirely on European football. There there was to be no repeat of that meltdown under Nagelsmann this season, and the club can now start looking ahead to facing some of the continent's elite sides in 2017/18. Any concerns that a first league loss this season might bring a dip in form were soon put to rest with a commanding 4-0 win against Mainz on Matchday 19. Watch: Nagelsmann's tactical genius in action! Hoffenheim have lost only twice since, and continue to turn heads with the attractive passing style that Nagelsmann has introduced. As well as being voted DFB Coach of the Year 2016 in March, the TSG tactician has also received praise from the highest footballing office in the land. "If Julian Nagelsmann keeps going like this, I'm convinced he'll be a great coach. Perhaps he wants to coach another team in Germany or abroad. Perhaps he'll be the national team coach one day. He has very good prospects." High praise indeed. With Europa League football now guaranteed, a finish among the Champions League places is well within Hoffenheim's grasp. It would be no less than the club and their talented young coach deserve. Click right here for more news from Hoffenheim!